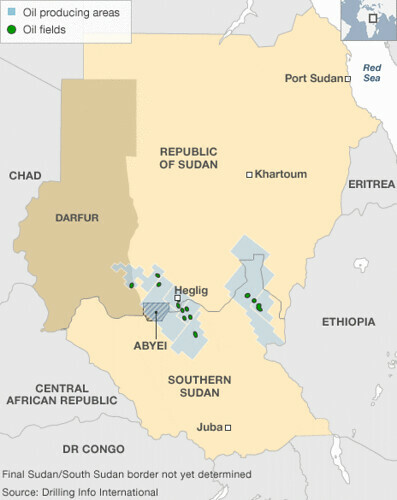 Border areas between Sudan and South Sudan where the proliferation of oil resources is a major cause for conflict. The South Sudan government recently withdrew from the Heglig oil fields after international condemnation., a photo by Pan-African News Wire File Photos on Flickr. Addis Ababa - Peace talks to end weeks of fighting between Sudan and South Sudan were deadlocked on Tuesday after failing to agree on where to set up a demilitarised zone along their contested border. "The position of the parties is still rather far apart on these issues," South Sudan's foreign minister Nhial Deng Nhial told reporters during a break in the week-long talks, which still continue despite the lack of progress. "We have not yet been able to agree on the line from which the safe demilitarised border zone is going to be drawn," Nhial said, but adding he remained optimistic a deal could yet be reached. Delegations from both countries met in the Ethiopian capital last week for the first face-to-face talks since deadly violence along the border last month that ignited fears of a return to all-out war. Defence ministers from Sudan and South Sudan met on Monday to discuss border security, including a cessation of hostilities and the establishment of a demilitarised border buffer zone. The African Union-led talks continued on Tuesday despite high tensions and accusations by the South Sudan's chief negotiator Pagan Amum, who said Khartoum had launched renewed air strikes on Monday. Sudan official Abdul Rahman Sir Al-Khatim denied the accusations as an "utter fabrication and lie" and insisted Khartoum was abiding by a joint African Union - United Nations demand to end hostilities. "We are respecting both the decisions of the UN of 2 May and the AU of 24 April," he said, calling on Juba to stop blaming Khartoum for violence, and warning that continued allegations could jeopardize the progress of the talks. "This will not help building the confidence... help us to go forward rather than sending these allegations without any evidence," he said. "We have made some progress, although it is not as we were expecting." Juba split from Sudan last July following one of Africa's longest wars, but the two sides have remained at loggerheads over a number of disputes, including border demarcation and oil transit fees. AU-lead talks have been ongoing since independence, but a number of ceasefire agreements - including a deal to demilitarise border areas - have been repeatedly violated by both sides.